One of the more obvious signs of a mold problem is a musty odor. This is caused by spores floating through the air and is usually an indication that the mold problem is not a small one. In the case that you suspect mold, don’t hesitate to get a professional mold inspection done so that you may stop the infestation from getting worse and more costly to fix. Mold spores are a known cause for allergies with the symptoms of watery eyes, sneezing, runny nose and nasal congestion. If one is actually allergic to mold it can cause redness of the skin, swelling, itching and worse depending on the severity of the allergy. Finally there are even more symptoms to be aware of such as headaches, dizziness and even memory loss. 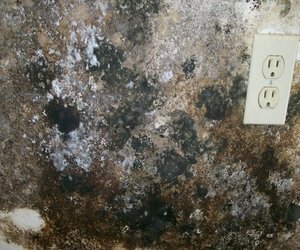 Due to the wide range of symptoms it may be difficult to pin the blame on mold. However if you detect any of the other signs of mold then do not wait to get an inspection or have the mold professionally removed. Another key sign of mold is water damage. The key to mold growth is humidity and water. It is not good if there are any signs of water damage such as discolored paint. In order for paint discoloration to occur, water must be sitting in contact for a long period of time. This is definitely long enough for a mold colony to sprout up and start causing trouble. So take note, if there is any water or flood damage on your property then mold is likely to be there too. If the water was removed quickly and properly by a trained extraction team with high powered equipment then there should be no mold growth. If you live in Tucson, heat is a given. At the time of writing this it is 101°F outside, and when you pair that with a high level of humidity such as that which comes with Tucson monsoon season then you have a recipe for disaster… or mold in this case. Since mold loves and needs moisture it is important to make sure that humidity levels are monitored. If you have humidifiers or if it is just humid from the weather, you need to keep an eye out for the visible signs of mold and also to keep the temperature down. We have had many cases over here where a home owner leaves their house for the summer and comes back to find that a leak or the humidity of monsoon season paired with the Tucson heat has turned the property into a giant mold colony. So keep an eye out for leaks and high humidity as they are key signs that you may have a mold problem on your hands. Remember to keep an eye out for all of the signs of mold and water damage. It is crucial to deal with the problem as soon as possible. If visible damage is not dealt with immediately, insurance can claim owner negligence and the problem will grow. Once it spreads, repair costs go up and the amount of damage it can cause increases. Get a professional to perform a mold inspection on your property if you suspect anything. If you have mold and you want a professional to inspect your property, give us a call or message us. We can perform a free mold inspection for property owners. If we find mold then we can remove it and restore your property to a healthy state without risk of the problem spreading or coming back. We have been proudly serving Tucson Arizona as a local and family owned business since 1999. Count on us to get the job done right!